For the area, see Thuringia (area). Thuringia is a releasable country in northern Germany. It has only a core on the province of Thuringa, initially held by Saxony. Thuringia became available on the map from 1445 onwards. From 1445 onwards, it holds three provinces which are stills cores of Saxony. In the startdate of the eigthy-years war, it has shrunk to one province, and is a vassal of Saxony. Later on, it is still a one-province minor, but independent. It disappears in 1815. 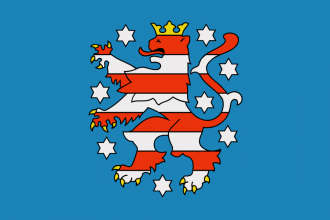 If Thuringia becomes free during a campain, it always have the dynasty of Wettin, so usually the same dynasty as Saxony, which stars with the dynasty Wettin. As country with Saxon primary culture Thuringia is able to form Prussia. This page was last edited on 22 October 2018, at 17:22.